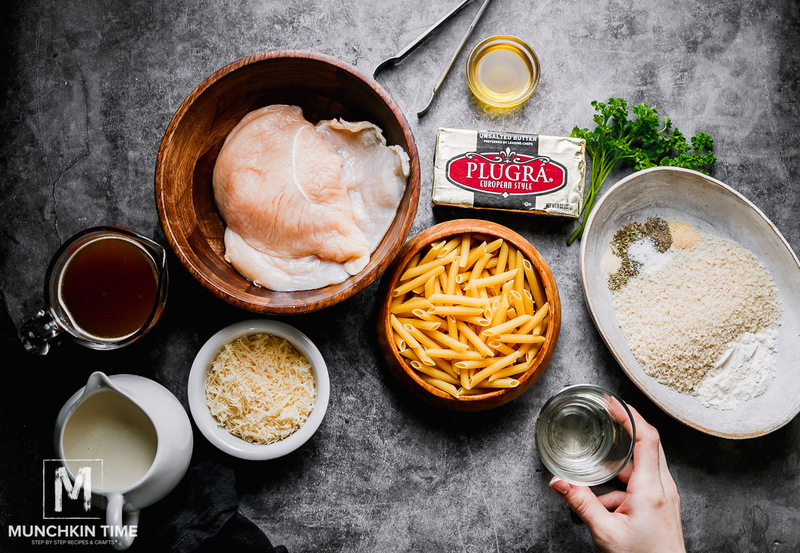 Easy Oven Baked Chicken Pasta in Buttery White Sauce Recipe is brought to you by Plugrá® premium butter made with American dairy, that is inspired by chefs. Thank you! 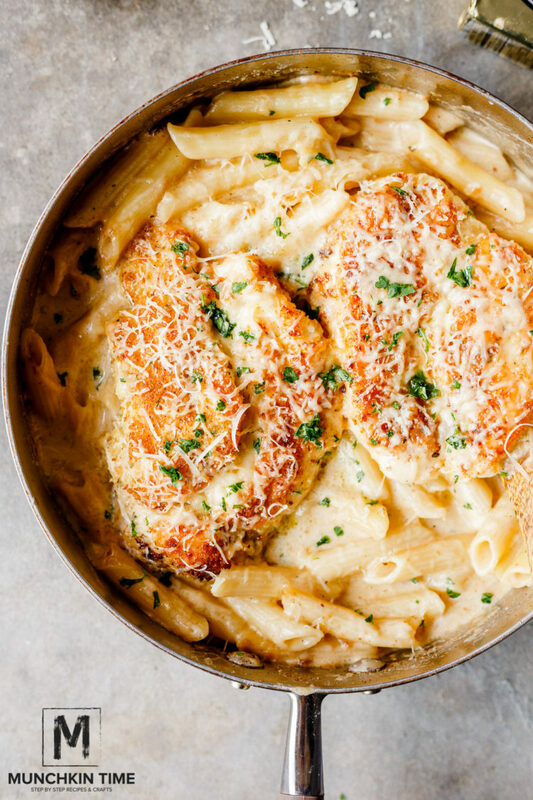 What makes Easy Oven Baked Chicken Pasta tastes AMAZING? Of course it’s a warm buttery white sauce and lots of parmesan cheese. 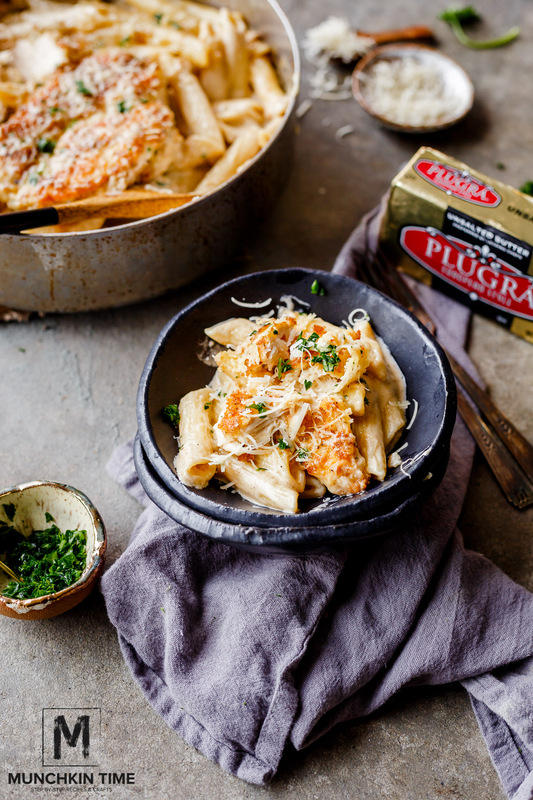 One of the ways you can go an extra step and make this delicious Oven Baked Chicken Pasta Recipe taste EXTRA DELICIOUS is by upgrading from regular butter to premium butter like Plugrá®, it can be found at your local Kroger Family of Brands Store. Plugrá® is extra creamy because it’s slow churned with real milk from American dairy farms. Always fresh, crafted without artificial ingredients and added hormones. It’s all in the details. Regular butter is 80% butterfat and higher in moisture, while Plugrá® is 82% butterfat and lower in moisture. The result is flakier pie crusts, softer cookies, and more flavorful sauces. Created by chefs who know that delicious dishes start with exceptional ingredients. Plugrá® is made for optimal performance in baking, cooking, and spreading. 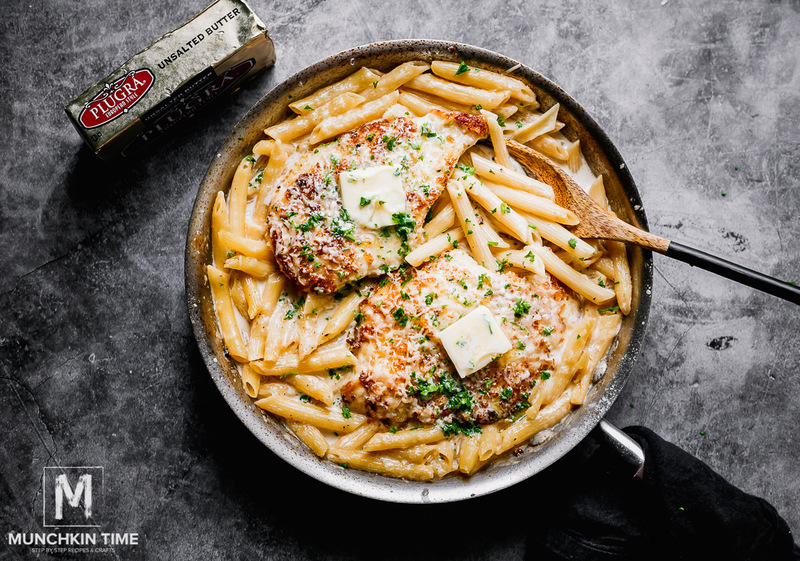 Make this scrumptious Oven Baked Chicken Breast and Pasta for dinner tonight using this premium butter and see the difference it makes in the flavor. You will love the rich buttery taste! 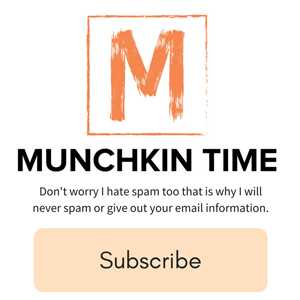 How to Season Chicken Breast? Pat chicken breast dry with paper towel, then season with 1/2 teaspoon Kosher salt and pepper, to taste. 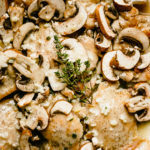 How to Make Pan Fried Chicken Breast? In a mixing plate mix together flour, breadcrumbs, garlic powder, onion powder, thyme, rosemary, oregano, 1/2 teaspoon Kosher salt and 1/4 teaspoon black pepper. 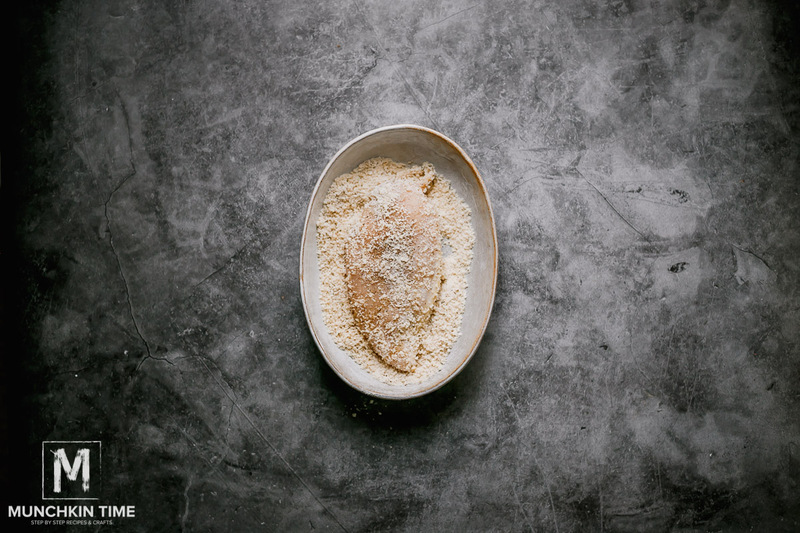 Dredge chicken breast in bread crumbs. Preheat olive oil on a medium heat in a oven-proof skillet. 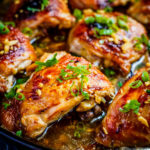 How to Sear Chicken Breast? 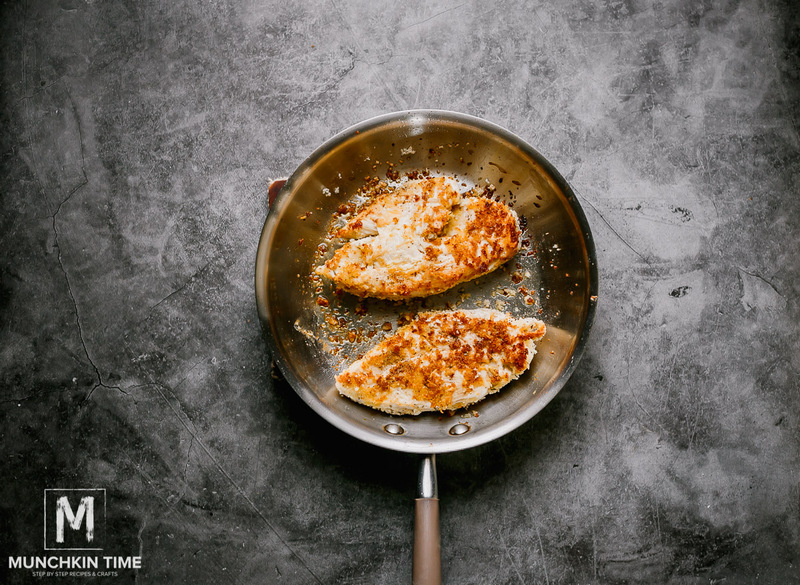 Add chicken breast and sear for about 3 minutes on both sides or until golden color (in this step you want to get the flavorful golden sear, the chicken breast will finish cooking in the oven). 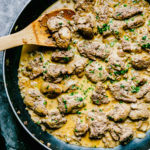 How to make White Wine Sauce? 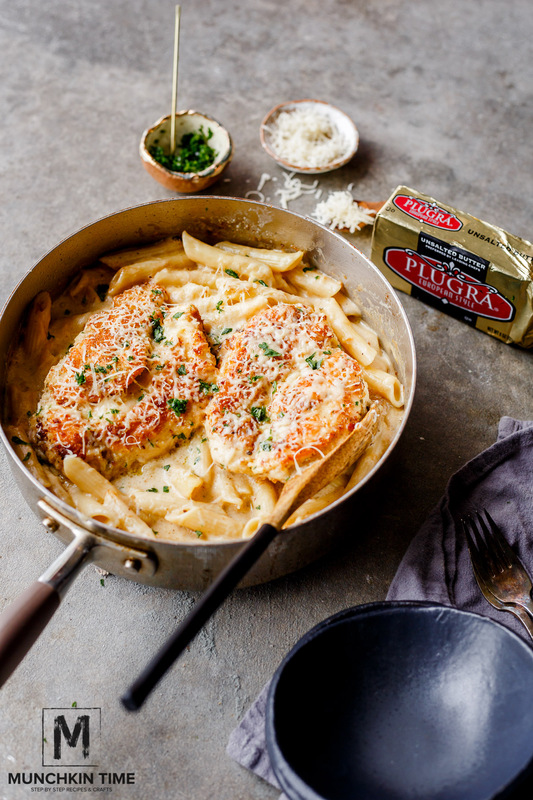 Using the same skillet, on a medium heat, add 2 tablespoon of Plugrá® butter. After butter melts add 1 tablespoon of flour and stir for 1 minute. Now pour in white wine and cook for about 1-2 minutes, or until reduces in half. Pour in chicken stock, bring it to a boil and cook on medium heat for 3-4 minutes. Season with salt and pepper, to taste. Stir in heavy whipping cream & bring it to a boil. Place cooked pasta into the sauce & seared chicken breast over the pasta, sprinkle parmesan cheese over the chicken and pasta, bake in the oven uncovered for about 12 minutes, or until chicken is no longer pink inside. 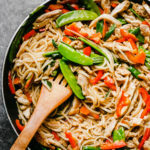 Cut chicken breast into strips, return back to the skillet. Q. 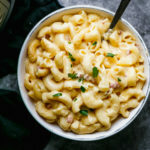 – Do YOU like this Easy Oven Baked Chicken Pasta in Buttery White Sauce? 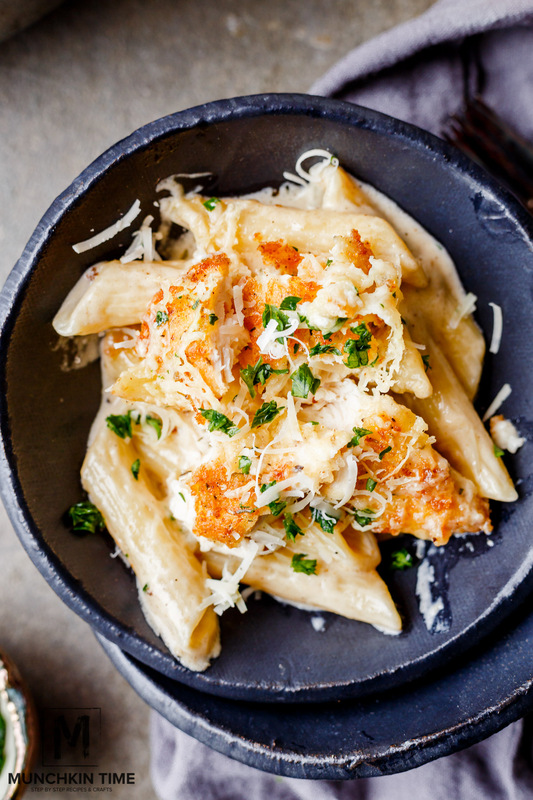 Easy Oven Baked Chicken Pasta Recipe with delicious buttery white sauce. In a mixing plate mix together flour, breadcrumbs, garlic powder, onion powder, thyme, rosemary, oregano, ½ teaspoon Kosher salt and ¼ teaspoon black pepper. Pat chicken breast dry with paper towel, then season with ½ teaspoon Kosher salt and pepper, to taste. Dredge chicken breast in bread crumbs. Preheat olive oil on a medium heat in a oven-proof skillet. 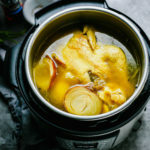 Add chicken breast and sear for about 3 minutes on both sides or until golden color (in this step you want to get the flavorful golden sear, the chicken breast will finish cooking in the oven). Remove chicken to a plate. 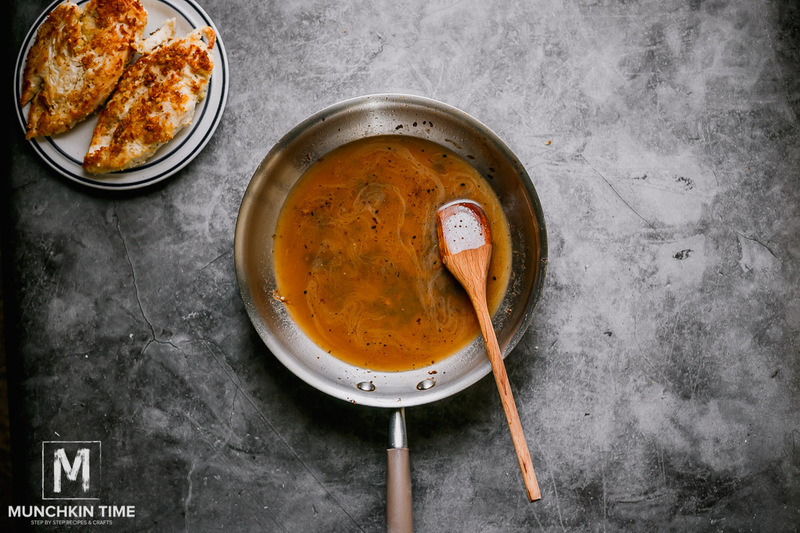 Using the same skillet, on a medium heat, add 2 tablespoon of Plugrá® butter. After butter melts add 1 tablespoon of flour and stir for 1 minute. Now pour in white wine and cook for about 1-2 minutes, or until reduces in half. Pour in chicken stock, bring it to a boil and cook on medium heat for 3-4 minutes. Season with salt and pepper, to taste. Stir in heavy whipping cream. Cut chicken breast into strips, return back to the skillet. Garnish with fresh parsley. Enjoy! If you make Easy Oven Baked Chicken Pasta Recipe PLEASE take a picture and share it on Instagram by tagging @Plugrabutter @FredMeyerStores & @MunchkinTimeBlog. 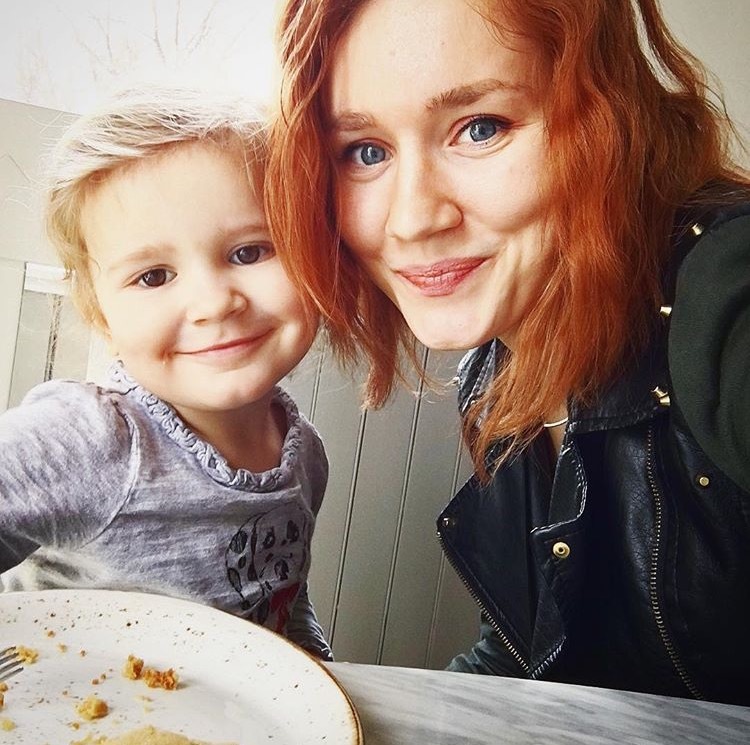 We would LOVE to see your creation! Thank you!